Author and hunter Reggie Baxter is there at the crack of dawn to take down this impressive turkey. 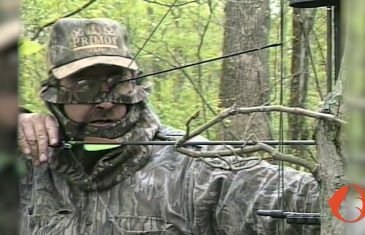 First aired on the Outdoor Channel in April of 1999. 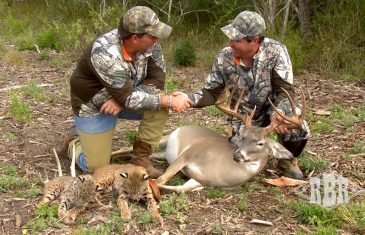 Hunter Jon Hanes harvests a nice round of tom. 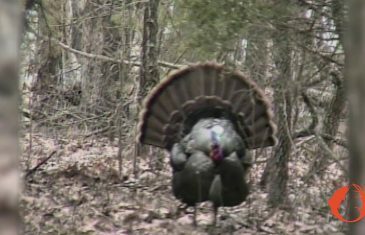 Reggie Baxter goes bowhunting for turkey in this segment which first aired in 1998. The American Outdoorsman takes you to the Illinois River, to hunt, I mean fish for the Asian Carp. Join Chris Brackett, Gene Price, and Steve Bailey as they actually shoot a bow and arrow at these giant jumping fish. Steve Bailey has a perfect shot on this great buck in Eastern Illinois. As day turns into night, Steve considers turning back and then hears a cackling in a distance that forces him to find his harvest tonight. Roger Barrette is stalking a field full of white tail. Suddenly a few race right out in front of him forcing an incredible on the run shot.